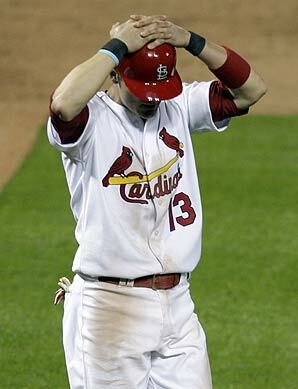 Cardinals Nation said goodbye to Blake Hawksworth yesterday as he was shipped to California for Ryan Theriot. We also braced ourselves to say adios to Brendan Ryan. The addition of Theriot could spell doom for Ryan at short. Or it could mean the end of the Skip Schumaker experiment at second. The position of shortstop really means only one thing in St. Louis: Ozzie Smith. If you can’t play like Ozzie, you aren’t good enough. And nobody can play like Ozzie. Brendan Ryan’s defense can be wizard-like at times. The potential is there, sure, but he let his offensive struggles affect his defensive skill in 2010. In 2009, Ryan’s fielding percentage at short was .984. That dropped in 2010 to .974. Ryan Theriot’s fielding percentage at short with the Chicago Cubs in 2009 was .976 and in 2010 with (also with the Cubs) was .971. Brendan Ryan’s a better fielder at shortstop. When the Cardinals moved professional outfielder Skip Schumaker, most of us shrugged our shoulders and hoped Skip would fair better than the guys moving through the revolving door at second. He hasn’t done that bad for a career outfielder and has even made some awesome plays. In 2009, his fielding percentage was .983, but that dropped in 2010 to .973. When Theriot went to LA in 2010, he moved seamlessly into second base. He’d been there before so it wasn’t much of a transition. At second in 2010, his fielding percentage was .986, far better than his fielding at short. Then there is Brendan Ryan. He’s done his time at second as well. In the 59 career games there, his fielding percentage is at .973. If the Cardinals were only worried about the defense, the answer would be so much easier. The offense was the issue in 2010. Ryan’s batting average dropped from .293 to .226. That’s a problem. Theriot hit .270. Not a massive improvement, but still better than #13. And Skip hit .265. Theriot’s batting average is pretty steady. Plus, Skip has the potential to get back to his .300 average. That leaves Brendan Ryan the odd duck out. Personally, I’d rather see Brendan Ryan at short, Theriot at second, and Skip in right field. Then we’d get the best of both worlds. But I don’t run the team.